Naughts & Cross stitches: Woohoo! I have a page finish! It's almost midnight here but I have to shout it to the world. 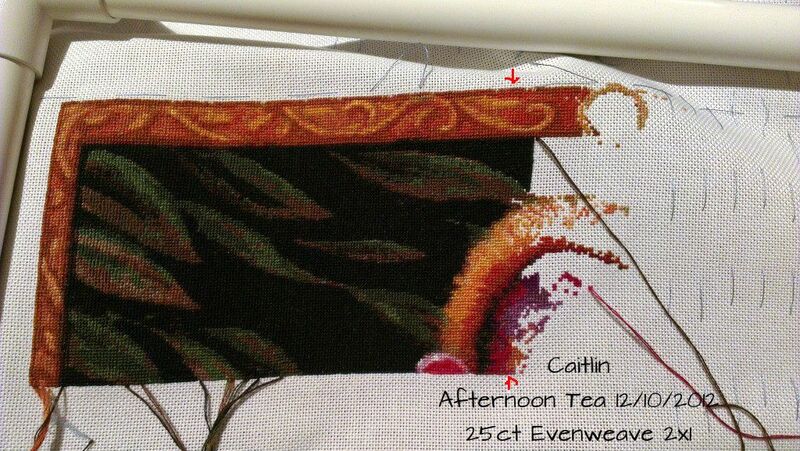 I have FINALLY finished page 2 of Afternoon Tea. I am so excited :D Now just to make it clear about the two little arrows on this picture. They're showing where page 2 finished. I have been stitching over more than one page so I had the equivalent of page 2 long before I actually managed to finish it. That said am happy dancing at the moment and now this needs to desperately go away because I need to do Christmas stitching again. I haven't been able to put this down all week! I love how things appear in a HAED! There is the top of the sugar pot, that bit of red. and the back of the chair. So many amazing purples appearing in this wonderful chair. I love the purple! So much gorgeous purple! Anyway it is almost bedtime. I am in Awe of everyone who stitch HEADs. Congrats on the page finish! Looks great! Wow, that's worth a shout out. Well done! A page done always feels like a major achievement on a haed! well done..